The Supreme Court (in a unanimous verdict) determined that the sculpture did not meet the definition of a “work for hire.” The Supreme Court hadn’t needed to deal with the second part of the lower court argument because by that time, the petitioners had conceded that the work was not among the “‘the nine categories of “specially ordered or commissioned” works enumerated’” in “‘second subsection of the 101 definition’”. Nonetheless, the Supreme Court had been required to interpret “the first subsection of the 101 definition” in relation to the facts of the case. “In determining whether a hired party is an employee under the general common law of agency, we consider the hiring party’s right to control the manner and means by which the product is accomplished. Among the other factors relevant to this inquiry are the skill required; the source of the instrumentalities and tools; the location of the work; the duration of the relationship between the parties; whether the hiring party has the right to assign additional projects to the hired party; the extent of the hired party’s discretion over when and how long to work; the method of payment; the hired party’s role in hiring and paying assistants; whether the work is part of the regular business of the hiring party; whether the hiring party is in business; the provision of employee benefits; and the tax treatment of the hired party. No one of these factors is determinative… . “The Court of Appeals for the District of Columbia Circuit reversed” saying that “under agency law, Reid was an independent contractor” and “sculpture is not one of the nine categories of works enumerated in that subsection”. In the absence of conclusive wording in the Copyright Act as to what differentiates a “work for hire” from a work that isn’t, the Supreme Court examined several possible approaches, including “the conventional master-servant relationship as understood by common-law agency doctrine.” Finding inadequate foundations for several positions, the Court rejected many. “We therefore conclude that the language and structure of 101 of the Act do not support” two particular approaches accepted by lower courts. D.C.N.Y. (3-20-1939) ¤ 27 F.Supp. 11. Fred Fisher worked for Maurice Shapiro under a contract dated August 25, 1909, until it was terminated February 7, 1911. Alfred Bryan started work for Maurice Shapiro September 10, 1910, under a contract renewed February 8, 1911, and terminated three days later. The songs written jointly by Fisher and Bryan were under employment to Shapiro, and included “Come Josephine in My Flying Machine” (Fall 1910), copyrighted October 18, 1910, by Shapiro, who died June 1, 1911. Plaintiff firm renewed the copyright October 19, 1937, as “Proprietor in copyright in a work made for hire.” “The right of renewal in a work made for hire is not given to the author, nor to the employer as author, but to the proprietor.” This renewal was proper. Fisher and Bryan wanted to renew in their own names. 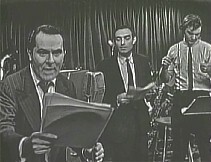 Some of the circumstances surrounding the original broadcast had been such that CBS might have been considered the owner of the broadcast and its script as of 1957. 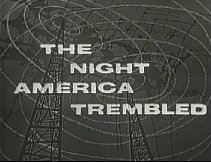 The network had paid all of the costs associated with the 1938 broadcast (it not having had a sponsor, for lack of sponsor interest) and had acquired a contract under which another company had arranged for programs to be produced by Orson Welles, who “produced and directed [the] radio broadcast on October 30, 1938” and who “conceived, originated, devised and created the style of said radio show ”. Nonetheless, the conditions on this series were that “Koch dealt with one [John] Houseman entirely and that the arrangement with Houseman was that, after a limited time, in view of the small fee paid Koch for writing the script all rights in the script would belong to Koch and not to” anyone else. The reader of this web page who sees that Orson Welles sued CBS might wonder how his name came into this. Welles testified through deposition that the arrangement between he “and Koch, the writer of the script for the radio show, was that of mere employer and employee, and that any rights in the script prepared by Koch were the property of [Welles] rather than Koch. However,… Koch dealt with one [John] Houseman entirely and that the arrangement with Houseman was that, after a limited time, in view of the small fee paid Koch for writing the script all rights in the script would belong to Koch and not to appellant Welles. Nowhere in the record and evidence is there any intimation that Houseman was not available as a witness in behalf of appellant [Houseman remained sharp-minded until his death in 1988] to contradict this testimony of Koch if it was untrue. Houseman was not called.” Neither was “Paul Stewart, an employee or associate of Welles [who] had conferences with Koch in connection with the script”. illustrations: the lower image is a typical scene of The Night America Trembled. Three performers focus on their radio scripts while performing a live broadcast the night before Halloween 1938. The round-faced actor on the left is introduced as the host of Mercury Theater but never referred to by name. During the broadcast, he performs several roles. When the actual broadcast had occurred nineteen years before this docudrama, Orson Welles was host — identified by name in the opening statement of the program — and versatile voice actor, portraying several characters. “In 1956, John Marascalco and Robert A. Blackwell co-wrote the song ‘Good Golly Miss Molly’… . On July 23, 1956, in exchange for royalties, Marascalco and Blackwell assigned their copyright interests in the song, including ‘any and all renewals of copyright’ to Venice [Music]. Venice registered the song with the Copyright Office on January 22, 1957, naming Venice as the copyright owner and Marascalco and Blackwell as the authors. On October 15, 1959, Blackwell assigned his royalties back to Venice. In 1973, Venice assigned its interest in the song to Argosy Ventures, which, in turn, assigned the interest to Fantasy, Inc… . “On March 15, 1986, Blackwell’s daughters [having inherited their father’s rights] assigned their interest in the song’s copyright to Marascalco in exchange for royalties. “Fantasy’s refusal to recognize Marascalco as the assignee of Blackwell’s interest prompted this action for a declaration of rights. Marascalco does not contest Fantasy’s ownership of the other one-half interest of the copyright. “Fantasy has failed to provide sufficient evidence to rebut the presumption that Blackwell was an author of the song. Accordingly, the Court finds that the song was not a ‘work made for hire.’” Fantasy had apparently assumed that Blackwell could be regarded as someone who had created the song as a “work for hire” because “At the time, Blackwell was employed by Specialty Records, dba Venice Music, as an ‘artists and repertoire man.’ His primary responsibilities included finding material for artists to record, auditioning prospective talent, and overseeing the production of recordings.” Songwriting was apparently not among the jobs he was expected to do to earn his salary, so it should be concluded that the songwriting he did do was on his own initiative and that he had a right to payment. Von Tilzer vs Jerry Vogel Music Co. (launch this) had rights to the renewal term in the song “Down on the Farm” being acquired from the widow of the lyricist, yet because the lyricist had worked on a work for-hire basis, she had no rights in the second term.